Srinagar, March 22: Three militants were killed in separate encounters with security forces on Friday in Shopian and Bandipora districts of Jammu and Kashmir, taking the number of ultras killed over the past 24 hours to five, officials said. Two militants were killed in an overnight gunbattle in Hajin area of Bandipora district, an army official said. The operation against the militants was started on Thursday but the security forces had to proceed with caution as two civilians had been taken hostage by the ultras, police said. While one civilian was rescued Thursday evening, the other hostage -- reportedly a minor -- might have been killed during the operation, a police official said on condition of anonymity. A police spokesman said a detailed statement on the operation will be issued very soon but did not elaborate about the fate of the civilian hostage. A militant was killed on Friday in an encounter with security forces in Shopian district. Jammu and Kashmir: 4 Security Personnel Martyred In Encounter With Terrorists In Kupwara district. 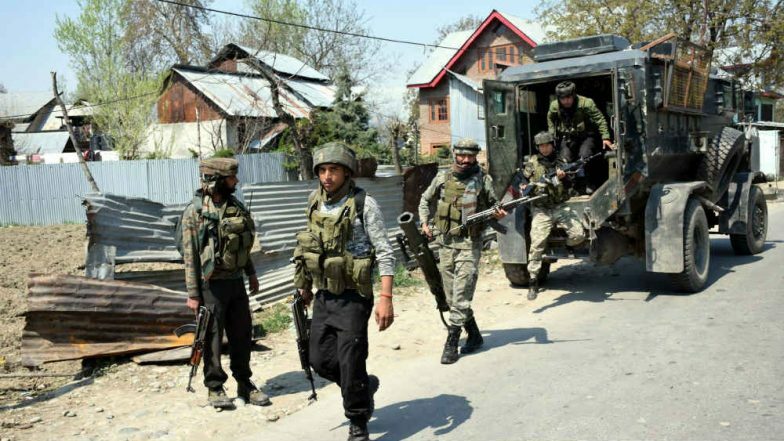 The security forces launched a cordon and search operation in Imamsahib area of Shopian in south Kashmir following information about presence of militants there, the army official said. He said the militants opened fired on the security forces, who retaliated, triggering a gun battle. One militant has been killed so far in the ongoing operation, the official said, adding that the identity and group affiliation of the slain ultra was being ascertained. Kupwara Encounter: 2 CRPF Jawans, 2 Jammu And Kashmir Policemen Martyred in Gunfight, 1 Civilian Dead. Another gun battle broke out between militants and security forces in Sopore area of north Kashmir's Baramulla district, a police official said. He said no casualties have been reported so far in the operation that is going on in Warpora area of Sopore. Two Jaish-e-Mohammad militants were killed in an encounter with security forces at Kalantara in Baramulla district on Thursday while three security force personnel, including an officer, suffered injuries during the operation. A police spokesman said one of the slain militants was Amir Rasool, a local from Sopore, while the other was a Pakistani national.